Work requirements for public assistance seem to be all the rage — at both the national and state levels — when other policies would do more to encourage and support work. President Trump signed an executive order April 10 enhancing enforcement of federal public assistance work requirement laws, evaluation of program effectiveness, and consolidation or elimination of “ineffective” programs. The Trump administration also is considering drug tests for SNAP (Food Stamp) recipients. Similar legislation in Iowa (Senate File 2370) intended to expand regulations on and further monitor recipients of public assistance in Iowa, but appears to have stalled as the 2018 session nears an end. This included implementing work requirements, drug testing, quarterly reviews of eligibility, and a one-year residency requirement. The Farm Bill draft released April 12 would reduce or eliminate SNAP benefits for 1 million households, or 2 million recipients, according to the Center on Budget and Policy Priorities (CBPP). Work requirements would force able-bodied adults without dependents to prove every month that they work or participate in a training program 20 hours per week. Severe sanctions for noncompliance would cut off benefits for one year the first time — three years the second. Recent research found recipients under work requirements for Temporary Assistance to Needy Families (TANF) continued to live below the federal poverty level, and that small increases in employment diminished over time and did not result in stable employment in most cases. In the long term, programs that provide training, skill building, and educational opportunities to recipients are shown to be more successful than only implementing work requirements. Evidence shows that people in SNAP households who can work do work. More than 80 percent work during the year before or after receiving benefits. Drug testing public assistance recipients has proven to be costly and frivolous. States that have implemented drug testing found that applicants have lower drug usage rates than the general population. The state of Missouri spent $336,297 in 2015 to test 293 of 31,336 TANF applicants and found only 38 positive results. Eleven percent of Iowans received public assistance in February of 2018. Already, able-bodied adult without dependents have work requirements to receive SNAP in the state of Iowa. By contrast, the Earned Income Tax Credit and Child Care Assistance (CCA) are policies that are effective in encouraging work. In addition, Iowa could make changes in work support programs, such as CCA, to reduce what are known as “cliff effects” — when families with a pay raise or a new job are faced with a net loss because a reduction in benefits exceeds the new income. Policies that support working families, not drug testing and work requirements, would do more to encourage work, raise family incomes, and boost local economies. Natalie Veldhouse is a research associate at the nonpartisan Iowa Policy Project. Some legislators may boast of a “historic” session. History will mark 2017 as a low point in Iowans’ respect and care for each other. To describe the 2017 Iowa legislative session as “historic” is not a label its leaders should wear with pride. Iowans needed a legislative session that worked to raise family incomes and expand educational opportunity. Iowans had long demanded water-quality improvement measures. Many called for lawmakers to address the lack of fairness, adequacy and accountability in a tax system laden with special-interest breaks and costly subsidies to corporations. Instead, Iowans got a continued ratcheting down of funding for PK-12 public education. There were significant and serious cuts in post-secondary education that will lead to tuition increases. We saw cuts to early-childhood education and other programs that serve our most at-risk children and neglect of the child-care assistance program that helps working families struggling to get by. The Legislature continues to demand little or nothing of industrial agriculture in cleaning up the mess it has left in our waters. Lawmakers tried to dismantle the Des Moines Water Works board, limited neighbors’ right to complain in court about pollution, and eliminated scientific research at the Leopold Center. Their ultimate action on water merely diverts resources from other priorities, such as education and public safety. Lawmakers largely left the tax issue to the next session. An overture in the House to reform Iowa’s reckless system of tax credits was a welcome acknowledgment that this issue needs attention, but devils in the details make further discussion of this issue during the interim even more welcome. Perhaps as troubling as the destructive nature of policy content this session, Iowa’s image of adherence to good governance took a big hit. The most controversial policy changes came not through collaborative, public discussion in committee, let alone the 2016 political campaigns, but were often dumped into lawmakers’ laps with little opportunity for amendments. Wage suppression, with a bill to preempt local minimum wage increases while refusing to raise Iowa’s repressive, 9-year-old minimum of $7.25. Workplace suppression, gutting collective bargaining protections for public employees, and making it more difficult for Iowans recover financially from injuries on the job. Health-care suppression, achieved in workers’ compensation legislation while also refusing to reverse Governor Branstad’s disastrous move to privatize Medicaid. Local suppression, whacking at local government control in a variety of areas: minimum wage, legal defenses against concentrated animal feeding operations (CAFOs), fireworks sales, and collective bargaining options. Voter suppression, with a bill to make it more difficult for many citizens, particularly low-income and senior voters, to exercise their right to vote. Suppression of children’s healthy development, with additional cuts to Early Childhood Iowa and Shared Visions that will reduce access to critical home visitation, child care and preschool services for some of our most at-risk youngsters. Some legislators may boast of a “historic” session. History will mark 2017 as a low point in Iowans’ respect and care for each other, a legacy that will not be celebrated when future Iowans look back on this session and the closing act of Governor Branstad’s long tenure in office. The Iowa Fiscal Partnership is a joint public policy analysis initiative of two nonpartisan, nonprofit, Iowa-based organizations — the Iowa Policy Project in Iowa City, and the Child & Family Policy Center in Des Moines. Reports are available at www.iowafiscal.org, and on the websites of the two partner organizations, www.iowapolicyproject.org and www.cfpciowa.org. Hundreds of single workers — and millions nationally — are taxed into poverty because they do not have kids and do not qualify for the EITC. And problems with child care assistance are being used to oppose a minimum-wage increase, even though the vast majority of affected workers do not have children. On Labor Day, let’s not forget the needs of single workers. Our focus at the Iowa Policy Project frequently emphasizes the impact of public policy on working families. But the demand of meeting a household budget is faced by more than parents, whether in single- or married-couple families. Single workers without children also need to get by. On Labor Day, many of these low-wage workers will be serving meals in restaurants, ringing up back-to-school supplies at the mall, or driving a truck down the highway. They deserve a decent day’s pay for a hard day’s work, but many of their paychecks are too small to make ends meet. An expanded EITC that targets this group would do more to help deliver a decent day’s pay. There are bipartisan proposals on the table in Washington to extend the EITC to these workers, 7.5 million of whom are now “taxed into poverty,” Marr notes. The table below shows the Iowa impacts of these proposals. CBPP has done much work on this issue. See this earlier report and another report by Marr and his colleagues at CBPP. As IPP’s Peter Fisher shows in Part 2 of our “Cost of Living in Iowa” report for 2016, more than a quarter of working single persons statewide (27.5 percent) do not make enough at work to meet a basic-needs household budget. 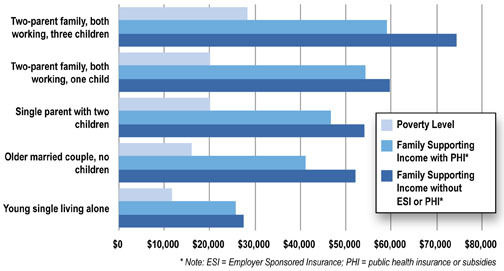 In fact, for those workers who fall short, they fall more than $10,000 short, on average. It is worth noting that this basic needs gap is even more severe for single parents, who fall almost $23,000 short, on average. One of the efforts being used to stop or hold down local minimum wage increases in Iowa is the issue of “cliff effects” in work support programs — particularly Child Care Assistance — in which benefits abruptly drop for a worker if he/she gets slightly higher pay. This is a very real issue for some workers, but not for the vast majority of workers who would benefit from a minimum wage increase statewide to $12 (phased in over five years), because they do not have children. It makes no sense to block a wage increase for the three-fourths or more of workers who are not affected by the child care issue. Rather, Iowa could raise the minimum wage and, separately, improve access to its Child Care Assistance program so that the cliff effects are eased or erased. There are ways to do so. See Fisher’s report with Lily French from 2014, Reducing Cliff Effects in Iowa Child Care Assistance. Past failures to improve both the minimum wage and child care eligibility should not end up as an excuse to fix neither. As the debate over a Polk County minimum wage continues, the so-called “cliff effect” is being cited as a reason to limit the increase in the wage. This is unfortunate. Capping the wage at a low level would hurt thousands of families, including many with burdensome child care costs. The “cliff effect” results from the design of Iowa’s Child Care Assistance program (CCA), which pays a portion of the cost of care for low-income families. Iowa has one of the lowest eligibility ceilings in the country: 145 percent of poverty. When a family’s income hits that level ($29,120 for a single mother with two children), benefits disappear. We do need to fix that program. But the failure of state lawmakers and the governor to address the CCA cliff effect is not a good reason to forgo needed wage increases for thousands of working families. An estimated 60,000 workers would benefit from an increase to $12 an hour in Polk County; 88,000 by an increase to $15 (phased in over several years). • Thousands have high child care costs and incomes below 145 percent of poverty but do not receive CCA. A 2007 study estimated that only about 1 in 3 Iowa families eligible for CCA were actually receiving it. The two-thirds with low wages but without assistance still need higher wages. • Second, a low wage cap would not help many families barely above 145 percent of poverty, but still facing child care costs of $4,000 to $5,000 a year per child. These families, in many cases married couples with one or both working at a low wage, can’t make ends meet. • Third, the other 62 to 64 percent of low-wage workers do not have children, and many families whose children are older do not need child care. A cap on the minimum wage hurts all of them. Moreover, we need to keep in mind that the cliff is not as sudden as it appears. Because Iowa moved to one-year eligibility, a family whose income rises enough to push them above 145 percent of poverty can continue to receive assistance for another year. In that time, they may find ways to adjust, such as quitting the second or third job or reducing hours or overtime, to stay eligible for CCA but have more time with their children. This is surely a benefit from a higher minimum wage. Policies that move families toward self-sufficiency are widely supported. We want workers to increase their earnings by furthering their education, finding higher paying jobs, gaining experience that earns them promotions — and have time to care for their families. Yes, we should fix our child care assistance program, which can penalize all of those efforts. But we should also fix a minimum wage stuck at a level well below what even a single person needs to get by. Past failures to fix one problem should not end up as an excuse to fix neither. One reason we produce our Cost of Living in Iowa research is to offer a better picture than official definitions of what it takes for a family to get by. Federal poverty guidelines are the basis for determining eligibility for public programs designed to support struggling workers. But those official guidelines have challenges that we address with basic-needs budget calculations in The Cost of Living in Iowa. The federal guidelines do not take into account regional differences in basic living expenses and were developed using outdated spending patterns more than 50 years ago. For example, the calculations that compose the federal poverty guidelines assume food is the largest expense, as it was in the 1960s, and that it consumes one-third of a family’s income. Today, however, the average family spends less than one-sixth of its budget on food. Omitted entirely from the guideline, child care is a far greater expense for families today with 23.5 million women with children under 18 in the labor force. Transportation and housing also consume a much larger portion of a family’s income than they did 50 years ago. Considering the vast changes in consumer spending since the poverty guidelines were developed, it is no wonder that this yardstick underestimates what Iowans must earn to cover their basic needs. Figure 1 below shows that a family supporting income — the before-tax earnings needed to provide after-tax income equal to the basic-needs budget — is much higher than the official poverty guidelines. In fact, family supporting income in the absence of public or employer provided health insurance ranges from 2.1 to 3.3 times the federal poverty guideline for the 10 family types discussed in this report. Most families, in other words, actually require more than twice the income identified as the poverty level in order to meet what most would consider basic household needs. Hilda L. Solis and Keith Hall, Women in the Labor Force: A Databook, Bureau of Labor Statistics (December 2011). Sylvia A. Allegretto, Basic family budgets: Working families’ incomes often fail to meet living expenses around the US, Economic Policy Institute (August 30, 2005). Posted by Peter Fisher, Research Director of the nonpartisan Iowa Policy Project and author of The Cost of Living in Iowa, 2016 Edition. Peter Fisher is a nationally recognized expert on tax and economic development policy. He holds a Ph.D. in Economics from the University of Wisconsin-Madison, and he is professor emeritus in the School of Urban and Regional Planning at the University of Iowa. Issues that were big for our state before the election remain big issues. Now that the votes are counted, the real work begins. Job 1? It could be any of a number of areas where solid research and analysis have shown better public policy could make a difference for a more prosperous, healthier Iowa. Take a step back from the TV ads and “gotcha” politics and these issues come clearly in focus. Allowing local government to regulate frac sand mining — When it comes to cigarettes, guns and large hog facilities the Iowa Legislature took away the right of local government to listen to citizen desires. The General Assembly and the Governor should let democracy thrive and not take away local control of sand mining. None of these issues are new and it’s not an exhaustive list. But these were big issues for our state before the election and remain so, no matter who is in charge. Together, we can build on the solid research cited above and lay the foundation for better public policy to support those priorities.